Moscow (AFP) - Russian opposition activists investigating the deaths of three special forces soldiers said Wednesday their findings indicate that elite Russian army reconnaissance units are operating in Ukraine. Two activists who travelled around central Russia this week said they found fresh graves of soldiers from a special forces brigade of the army's Main Intelligence Directorate (GRU), which is based in Tambov, a city 400 kilometres (250 miles) south of Moscow. Their investigation came as the Ukrainian authorities showed off two captured Russians they claim are serving GRU soldiers detained after being wounded in a firefight while on a scouting mission in war-torn east Ukraine. 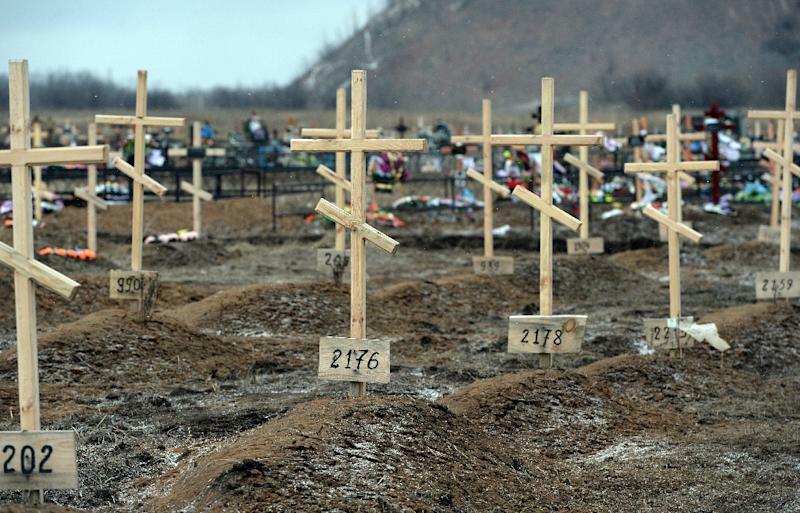 One of the activists Vadim Korovin -- who posted pictures of the graves online -- told AFP that the burials helped show that the Russian military is carrying out "large-scale reconnaissance operations" in east Ukraine despite a tenuous truce. One of the graves is near Tambov while the other is in the Tatarstan region on the Volga. Both show the date of death as May 5, 2015 and both have been adorned with identical wreaths from the Russian defence ministry, according to the pictures. A third soldier has been buried in a village in the southern Kurgan region, the activist claimed. Russia vehemently denies Ukrainian and Western assertions that its regular army is involved in the conflict in eastern Ukraine, where over 6,200 people have been killed since April last year. Moscow claims that Russian citizens fighting alongside rebels have gone to Ukraine independently as volunteers. But Korovin said the graves and information gathered from posts by grieving relatives and friends on social networking sites showed they were killed in Ukraine while on active duty. "They were killed in the same place at the same time," Korovin told AFP. "They were soldiers with the army," he said. "Not one of them was a volunteer." Russia's defence ministry was unavailable for immediate comment on the claims. On Tuesday the ministry said the two Russians in Ukrainian custody had left the army, but still insisted on their release. Korovin, who is also an assistant to opposition MP Dmitry Gudkov, said he spoke by phone with the mother of one of the soldiers, Anton Savelyev, who was at first keen to meet but then changed her mind after a visit to the military base. The army is able to keep continuing involvement in Ukraine quiet by hushing up the families of soldiers who have been killed, he said. "It's a disgrace that Russia is lying about not having soldiers there," Korovin said. "Wars get stopped because of public opinion, but here people are silent."